Rita Lorraine Alfred, 64, of Porter, Texas passed away on Tuesday, December 4, 2018 She was born on Friday, March 26, 1954 in Livingston, Texas to James Melton Whitten and Ruth Lucille(Parker) Whitten, both of whom have preceded her in death. Rita was also preceded in death by her father, James Melton Whitten, mother, Ruth Lucille(Parker) Whitten, sister, Karen Whitten. Left to cherish her memory is her loving spouse Ronnie Alfred ; two daughters, Sebina and George, Christie Alfred; son, Ronnie Wayne Alfred and wife Stephanie; four brothers, Danny Whitten and wife Sherry, Melton Whitten and amy, David Whitten and wife Barbara, Joseph Whitten; sister, Rhonda Kimbro and husband Daniel; grandchidren, Heather and Samantha Smart; grandchildren, Chloe and Baylee Alfred, Tyler Mattingly,; along with numerous other loving family and treasured friends. Visitation for Rita will be held at Neal Funeral Home on December 8, 2018 from 12:00 pm to 2:00 pm. 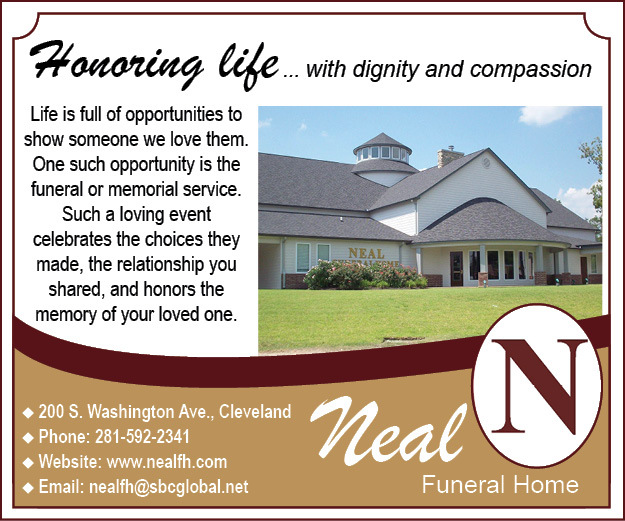 Funeral Services for will be held at Neal Funeral Home on Saturday, December 8, 2018 at Neal Funeral Home at 2:00 pm. Interment for Rita will immediately follow at Morgan Cemetery. Glen Mead officiating.